Mexico has a very high diversity of scorpions, but also many medical important species in the genus Centruroides Marx, 1890 (Buthidae). Several of these species have an urban distribution making scorpions a significant health problems in some areas. Lidia Riano-Umbarila and co-workers have recently published a major study of the medical importance of several Centruroides species based on LD50 tests (a controversial test from a animal welfare and ethics point of view). 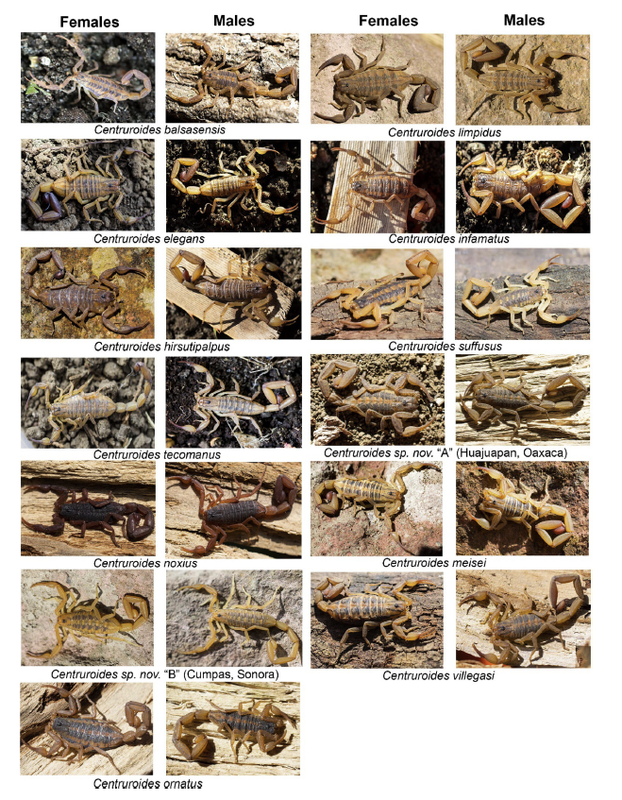 The article add more knowledge to the list of potential dangerous scorpions species in Mexico (click on the picture to see the species mentioned in this study). The increment in the number of scorpion envenoming cases in Mexico is mainly associated to the rapid growth of the urban areas, and consequently, to the invasion of natural habitats of these arachnids. On the other hand, there is a great diversity of scorpion species, so it is indispensable to identify those of medical importance, which we now know are many more than the 7-8 previously reported as dangerous to humans. Because different LD50 values have been reported for the venom of the same species, probably due to variations in the experimental conditions used, in this work we determined the LD50 values for the venoms of 13 different species of scorpions using simple but systematic procedures. 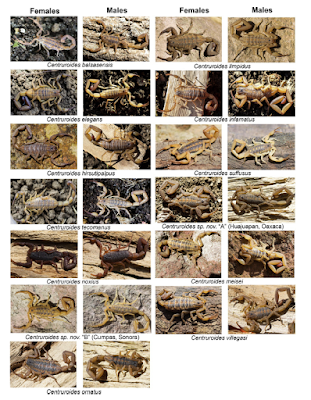 This information constitutes a referent on the level of toxicity of medically important scorpion species from Mexico and establishes the bases for a more comprehensive assessment of the neutralizing capacity of current and developing antivenoms. Nächste News Wohnungsbrand: Giftschlange im Haus?